Fairy tales do a better job of teaching kids the values of honesty and hard work than all the dressing-down you may administer or the sermons you deliver. Kids learn from examples. Adults are no different. They feel inspired by the stories of struggle, hardship, courage, and triumph of our real-life heroes and feel motivated to emulate them. Have you seen a soccer coach teaching in a classroom or someone learning to drive a car by reading how-to manuals? No. Some tasks are learned best with hands-on training. Scenario-based eLearning (SBL) courses combine the magical appeal and relevance of stories with the realism of hands-on training within a virtual environment. Virtual scenarios let learners gather professional expertise and experience within a much shorter duration than what they would have obtained from just working at their real jobs. What is more, scenario-based learning lets them learn through a trial-and-error process that is as effective as getting an on-job training but without having to face the consequences or bear the costs of a wrong decision. Scenario-based learning is well-suited to teach or help the learner hone skills that involve decision-making. Scenarios are often used to teach soft skills like communicating with customers to sell various offerings or resolve complaints. Sometimes learners need to learn, practice, and perfect skills like emergency preparedness and reaction, so they are not caught unaware when a crisis actually arises. SBL is the best instructional strategy to achieve this end. In this post we will take over a simple and proven model to guide your planning of a scenario for your eLearning course. 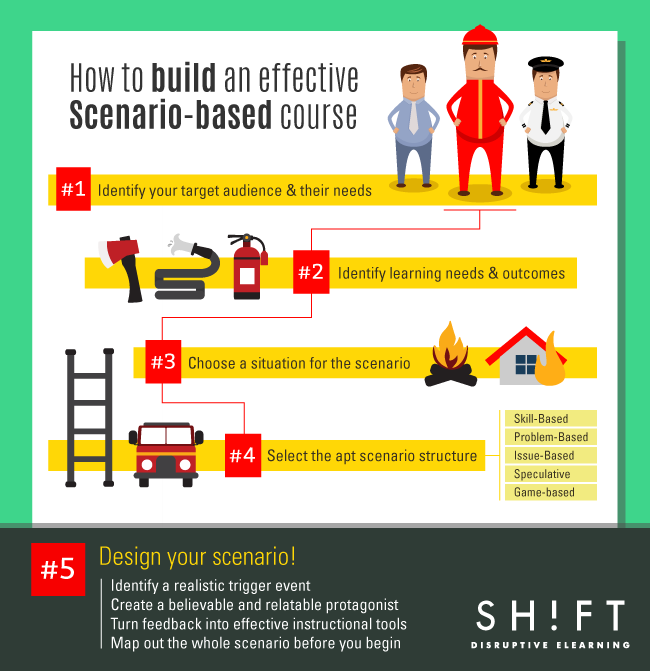 A scenario in an eLearning course is essentially a story. It has a plot, characters, and a problem that the learners resolve. The plot mirrors the workplace reality of the learners. The protagonist has a similar life situation as that of the learners; he shares their goals and aspirations and is plagued by the same workplace woes as they are. He is up against an antagonist that is actually the problem that the course has set out to resolve. Your work is cut out! You have to create an engaging interactive scenario that feels "real" to your learners. They should be able to relate to the protagonist and find him believable when he guides and advises them. Are they just starting out in their careers, or are they mid-level executives who know a thing or two about the industry? The answer to this question will help you determine their prior knowledge. What do your learners expect from the course? Will they take your course to learn a new skill, or do they want to refresh their memories? Those who want a recap would appreciate scenarios that pan out quickly rather than those long drawn-out ones where they are expected to participate and make decisions. What are their professional goals and aspirations? For instance, it is likely that an oil rig operator aspires to be the manager of operations. So he would expect your technical course to teach him to not only operate drills but also troubleshoot these machines and audit operational records like the footage drilled. An SME with hands-on experience can help you find the answers to these questions. Else, you have to scout for someone, maybe a supervisor, who has an insight into the job of your target audience. However, the best way to ensure that you get to know the learners inside out is to speak to one or more members of your target audience or watch them in action at their workplaces. What do you expect your learners to experience after they complete the course? Will they learn a new skill, or will they go back to their workplaces having refreshed their memories? Will they learn to make decisions independently after taking the course, or will they be able to interact more efficiently with customers, possibly even up-sell? Do you want to bring about a change in behavior or attitude with your course? The answers to these questions will help you identify the critical lessons you would want to impart through the course. What business needs will the course fulfill? You are commissioned by internal or external clients to design and develop a course. Your client has some corporate goals in mind, and he expects your course to help him achieve these objectives. Probably he wants the machine operators in his company to also assume the responsibilities of a supervisor and wants to roll out a course that will teach them how to think critically. Poke and prod the business executives to spell out these often-unuttered goals, so you can design scenarios that deliver the necessary "business impact." What are the situations where the learners will be expected to apply their knowledge? If you have gleaned a thorough knowledge of the workplace realities of your learners, you can identify the situations where they will be called to test their knowledge. There may, of course, be a multitude of such situations. So how do you pick the most relevant ones that will determine the learning outcomes? Do the DIF analysis. Identify situations where Difficult or complex decisions have to be made. Then pore over these situations to identify the most Important or critical considerations the learner has to keep in mind to make the right decision. For instance, a salesperson should keep in mind the budget of the customer; the budding paramedic must remember to ask if his patient suffers from cardiac complications before he gives him any shot; and the firefighter must look around for exits before rushing into a burning building. Finally, consider situations that arise Frequently and provide opportunities to learners to learn or apply good practices or those situations where decision-making is likely to be influenced by prevalent myths or misunderstandings. There may be ample critical situations at the workplace where your learners will be expected to apply their knowledge. But you cannot or should not turn every situation into a scenario. Neither will every situation lend itself to this instructional treatment. So how should you choose a situation to turn it into a scenario? Prioritize critical or challenging situations. Choose non-routine tasks that do not crop up at the workplace frequently, so learners do not have the chance to exercise their knowledge. Determine how involved the learner needs to be in a situation before creating a scenario from it. In a real-life critical situation at the workplace, the learner may not have to make some high-level decisions. So it is futile to create decision points for these within your scenario. In fact, you may not even want to have a scenario for this topic. Too much interaction can be an overkill! Determine if a scenario can provide the requisite level of interaction that a situation demands. A scenario is akin to a practice activity; it recreates reality within a virtual environment where learners can learn and hone their skills. These practice sessions should compel learners to think and act in a way they would do if they face these situations in real life. Determine if there is an inherent conflict in the situation. The primary goal of a scenario is to teach learners how to resolve a problem. If everything is hunky-dory at their workplaces, why would the learners take your course? Identify a realistic trigger event. The trigger event sets the scene for the scenario to unfold and a problem or conflict to come to the fore. Of course, the trigger event has to mirror the reality of the learners. Some likely trigger events are a fire breaking out within the office premises or a customer lodging a complaint. Create a believable and relatable protagonist. The protagonist in your scenario is supposed to inspire the learners to modify or change their behavior. So he should walk, talk, act, and dress in a way that learners can relate to. Turn feedback into effective instructional tools. Explain the mistakes to the learners. Suggest alternate ways to arrive at solutions. Since your technical guy is taking the pain to write the codes, you might as well make the feedback more effective instructionally! Scenario-based learning is an effective instructional strategy. There are many ways in which scenarios can fall flat on the face. But you are an instructional designer; take up the challenge!